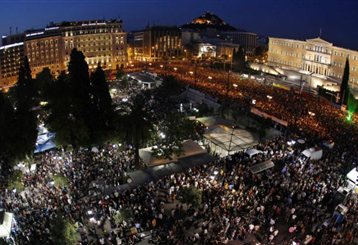 This is the fifth day and the crowd is increasing in Syntagma square in Athens. There must have been more than 30.000 people this evening and there are still there more than 10.000 at 11.30 pm (today). As a genuine gathering of the multitude there are not prevailing slogans apart from “thefts” and “take a helicopter and leave this place” (it refers to what has happened in Argentina). Flags of Argentina can be also seen among the demonstrators. In the front a banner says in Spanish “we are desperate, we woke-up. What time is it? Its time for them to leave”. People are dancing shouting or just hanging around talking to each other. A “general assembly” is held at late hours in the square, where people can take the microphone, speak and say what they think freely. It’s not stopping and it will not stop although I think that maybe there will be less people the forthcoming days. Maybe you are not aware on the details of the Greek time lines. There are enough money for the government until the 14 July and they desperately need the next dose of the IMF and the EU to keep the country running. EU governments are blackmailing, asking for a national consensus of at least the governing socialist party and the conservative right party, but the conservatives do not accept. They are asking for a huge privatization plan which practically spans all public enterprises including water companies and land. The latter is something quite difficult to be accepted by the public opinion. The idea that prevails is that after selling all these crucial resources nothing will really change for the people and most possibly we will be in the same position of bankruptcy after a year or maybe two having lost by this time most of public resources. Also a huge tax collection plan is under finalization which according to leakages it will cost 3.000-4000 euros annually for a family with 4 persons . This means that a lot of marginally surviving people will fell below the elementary standard of living. Another 150.000 unemployed are expected for the forthcoming year. Final decisions will be announced most probably at 6th of June – so keep this date in mind. It might be the beginning of real bloody demonstrations. What are the political implications of this mass mobilization and which are the probable effects? Although is difficult to say I am thinking that most probably if this dynamic goes on it might be impossible for the government to vote for the new measures. At this stage political instability with these time lines means bankruptcy. 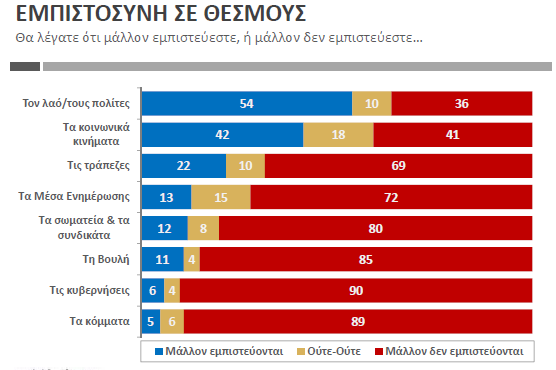 Another interesting story is that parts of the national capitalist class are seriously thinking of bankrupting the country and take over with a new drachma. This is not discussed politically openly because a return to a national currency will be extremely painful for the masses. In fact the story of Argentina is well known. My impression of the overall situation is that for several reasons Greece follows the road to an open bankruptcy with several people waiting to benefit from that and nobody taking the political risk to support it. Since European governments are deeply divided on the Greek crisis, it is difficult to believe that they will act in a coordinated, quick and generous way to avoid the storm, although this cannot be ruled out.